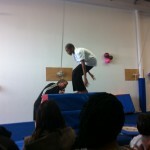 Last night I had the pleasure of attending the year-end gymnastics program for Samuel Edmond, one of our grade 5 students. I have put some pictures below. 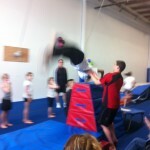 They are “action” shots so not the best quality but, you will get the idea. If you have any pictures of something that your child is doing please send them in to me. I would love to post them. Our new and updated website will be launched in the beginning of July. I am excited about our new look. If you have ideas or suggestions of what we need on our website please let us know. We appreciate and value your feedback. I am looking forward to our “Week of Prayer” next week. K-6 will meet at 11:00 am each day and 7-12 will meet at 10:00 am. Please check out the modified class schedule that is posted on our homepage. This morning I am happy that I can change and grow. I don’t know about you but, I tend to always have ideas of what I can and should do next. Trying new things, making plans and looking ahead excites me and gives me a reason to get up in the morning. I love to wake up each day with the possibility of what can be done. Some days its as simple as clean my bedroom or chat with my parents on the phone. Other days it might be more grand: try to run 5k, bake a new recipe or work on the plan for our new webpage. I am glad that God wants us to change and grow. God is working in us to make us better. The circumstances and opportunities that God places before us allow us to change and grow. We of course can choose the direction we head but, He is there to make us better. So, take what today has to offer you and grow and learn. Enjoy the journey that God had in store for you.